Broad-bodied Chaser (Libellula depressa). Male. Taken at Abingdon, Oxon., on May 18th 2018. Approx 3x lifesize. Male. Taken at Abingdon, Oxon., on May 18th 2018. 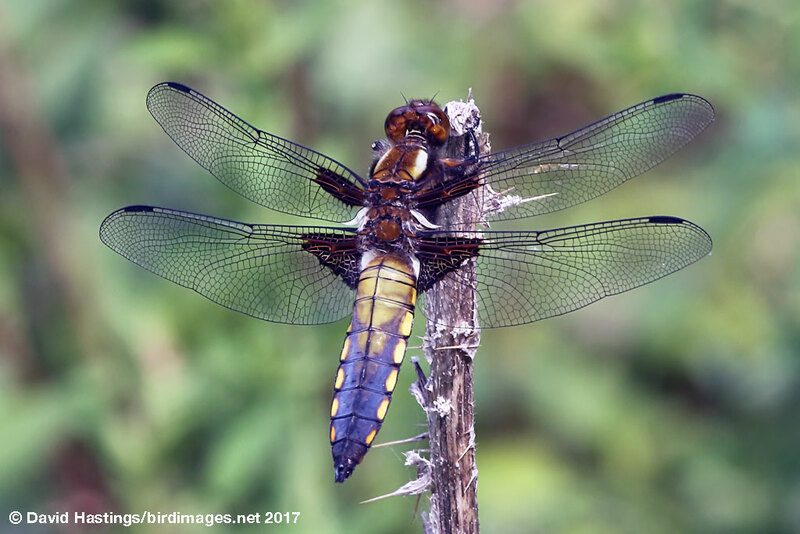 Broad-bodied Chaser (Libellula depressa). Male. Taken at Bernwood Forest, Bucks on June 18th 2018. Approx 3x lifesize. Male. Taken at Bernwood Forest, Bucks on June 18th 2018. Broad-bodied Chaser (Libellula depressa). Immature male. Taken in the Velebits National Park, Croatia, on June 11th 2017. Approx 3x lifesize. Immature male. Taken in the Velebits National Park, Croatia, on June 11th 2017. Broad-bodied Chaser (Libellula depressa). Female. Taken at Bucknell Wood, Northants, on May 28th 2016. Approx 3x lifesize. Female. Taken at Bucknell Wood, Northants, on May 28th 2016. 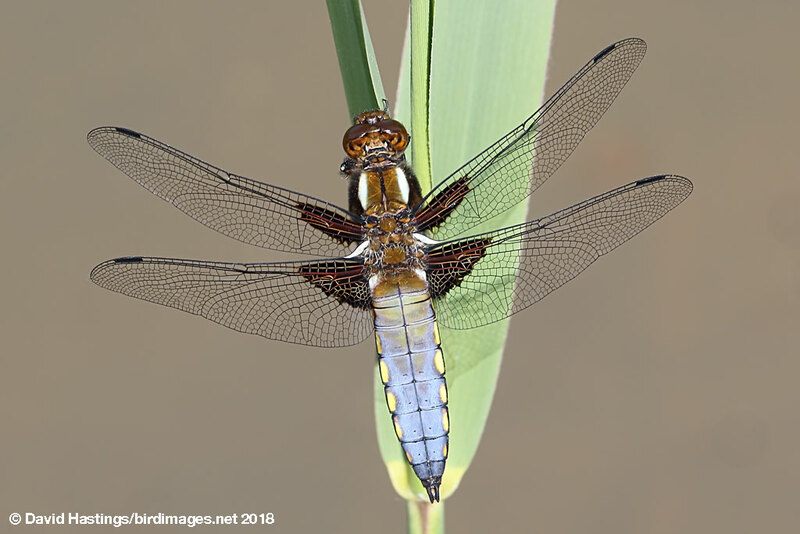 Broad-bodied Chaser (Libellula depressa). Female. Taken at Kelling Heath, Norfolk on June 26th 2012. Approx 3x lifesize. Female. Taken at Kelling Heath, Norfolk on June 26th 2012. This species has a very broad, flattened abdomen, which makes the insect appear fat. Both sexes have pale blue, thin ante-humeral stripes and brown eyes. The wing bases and wing spots are very dark brown. Males quickly develop a blue pruinescence on the abdomen with yellow spots along the segment sides. Females are a golden brown on the abdomen, again with yellow spots at the margins. Sometimes old females can develop limited pruinosity, but it is not as extensive as that in the male. 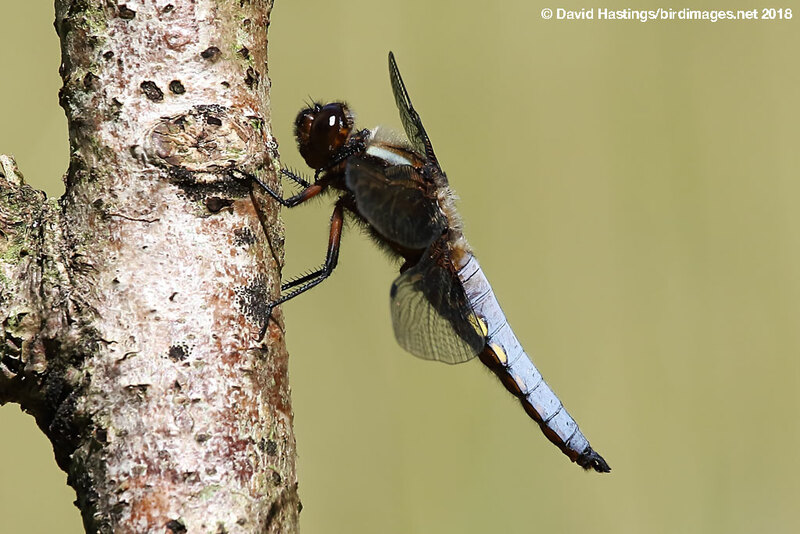 The Broad-bodied Chaser is found in England and Wales. Its prefered habitat is a wide range of mostly stagnant waters, especially those which are small, shallow, sunny and bare. It is usually quick to colonise new ponds. Eggs are laid in flight. They hatch after about three weeks and the larvae live in bottom sediment. Nymphs take between one and three years to mature into adults. The flight period is from May to August. Males are aggressively territorial, taking up positions on bankside vegetation, from where they launch missions to chase intruders or intercept females. Fairly common in southern Britain.